This project’s predecessor, Multi-sensor Data Fusion, showed how powerful archaeological geophysics can be when several geophysical sensors are used in concert and the results are integrated. Along the way the multi-sensor data fusion project also developed new, innovative methods for processing and integrating the data. The new approach proved to be more cost-effective, more reliable, and much less invasive than traditional archaeological methods (excavation) for the task of evaluating eligibility for the National Register of Historic Places (NRHP) in compliance with federal law. Yet, the time and expertise needed to achieve these results are not accessible to most Department of Defense Cultural Resource Management (CRM) personnel (federal archaeologists). (1) Assemble a single, user-friendly software product that will allow users to more easily process and integrate multiple geophysical datasets. The integrated, multi-sensor approach requires the use of several different Archaeo-geophysical methods (magnetometry, electrical resistance, electrical conductivity, magnetic susceptibility, and ground-penetrating radar). Each method gives unique results due to the measurement of different physical properties or by focusing on different depths. Since archaeological sites are highly variable, using multiple sensors increases the probability that a variety of archaeological features will be detected. Geophysical practitioners currently process data using a variety of software products that are often idiosyncratic, require repetitive actions, and do not provide a suitable medium for integrating data from diverse instruments. Widespread use of the integrated multi-sensor approach can only be achieved by assembling a single, user-friendly software to meet all the needs for processing, integrating, analyzing, and interpreting data from all standard sensor types. This software,ArchaeoFusion, is currently in beta test. It will provide all necessary processing routines for each method, and a variety of algorithms for data fusion. Preconfigured operation stacks will allow geophysical practitioners with modest levels of expertise to achieve reliable results. (2) Demonstrate the cost and performance benefits of the new software and the integrated, multi-sensor approach. The cost and performance benefits of the integrated multi-sensor approach and ArchaeoFusion has been demonstrated to a group of geophysical practitioners representing DoD and other federal land managing agencies (e.g., NPS, USFS). This User Group worked alongside the ESTCP team in collecting and processing data at the demonstration site. Reliability of interpretations based on ArchaeoFusion will be quantified via small scale ground truthing excavations. Project results are being reported to the relevant professional communities by a project report, presentations at professional conferences, widely distributed non-technical fact sheets, and published articles. ArchaeoFusion will be provided at no cost to DoD CRM programs and personnel that use geophysical survey. ArchaeoFusion will dramatically streamline the processing and integration of geophysical data, permitting a wide range of DoD and other CRM programs to realize the cost and reliability benefits of a multi-sensor, integrated approach to site evaluation. Use of this approach will dramatically reduce costs of the future mitigation of archaeological sites, thereby making it much more feasible to clear lands needed for military training and other undertakings. 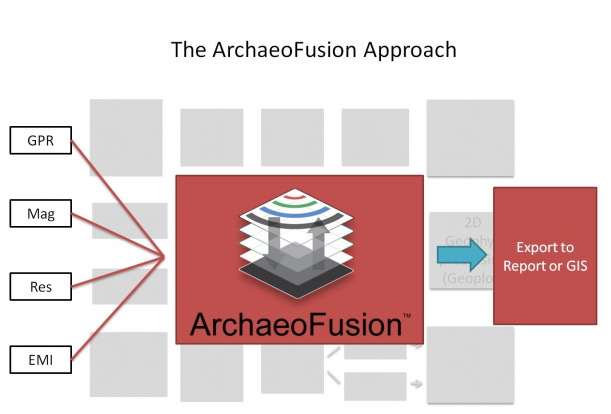 For a more detailed look at ArchaeoFusion’s features go here.